Super Punch-Out!! 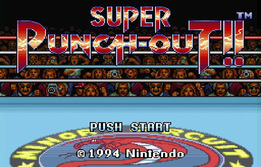 is the second console game in the Punch-Out!! series (or third, depending on your perspective) and I actually think it’s a significant step up from the first game. Once again you play as Little Mac as he tries to fight his way up the W.B.V.A. Championships. The gameplay is essentially identical to the first game; you stand in one spot and can punch upward or downward at your foes, while also being able to duck and dodge left and right. You are also able to charge up attacks, which you should incorporate into your fighting strategies. What I like about this one, though, is the fact that the enhanced capabilities of the SNES compared to the NES, mean that the characters are really brought to life this time. There are short voice samples for everyone and the improved graphics really emphasise their quirky personalities. What’s more is that the game is a little less overt with its racial stereotypes; sure, they’re still there, but they’re just a bit less uncomfortable than they were in the last game. I was sad that King Hippo (my favourite fighter in the first game) did not return, but at the same time I was very fond of the new fighter Bear Hugger. There is a nice mixture of new and returning characters. A small thing I didn’t like is that Little Mac has undergone a redesign and his coach Doc Louis does not appear. For me, the change in Mac’s design made it a little harder to connect to the first title. In most respects though, this is just an all-round improved version of the first game; it’s the exact same formula, but they’ve managed to keep it fresh. Much like the first game it does get very hard towards the end though, but it is generally a little easier.